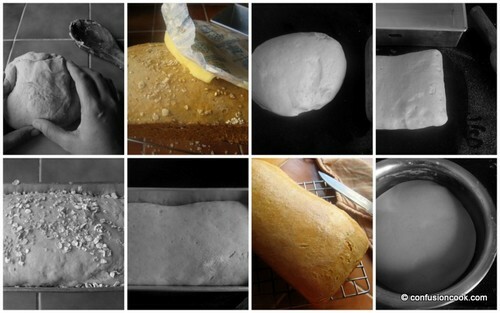 Bread has been the big monster in my baking repertoire [if that is what it is ;)] The YEAST beast was too big to handle. It’s not as if I didn’t try, I did. Though the results were not encouraging enough, I did make another attempt to bake a pizza dough but THE monster didn’t froth & foam up & I threw away all the ingredients in the trash. After that no more Yeasty Beasty for me! 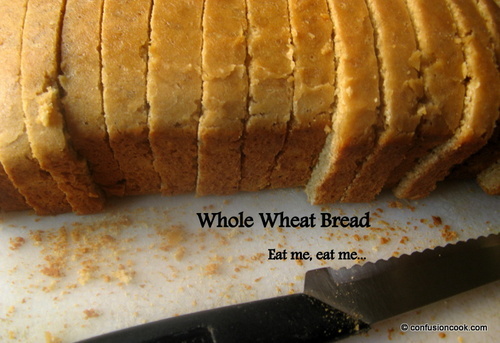 I added powdered milk to give lighter texture as wheat breads are generally denser. Also I slightly increased the quantity of yeast. In my first attempt I wanted to produce something V would eat without nit-picking! Well I was wrong, he didn’t nit-pick, he loved it. He couldn’t keep praising the bread all day, all week! Now he wants me to bake a french loaf using the same recipe, phew men have no control over their wants! I also used canola oil in place of butter or ghee as mentioned in the recipe. 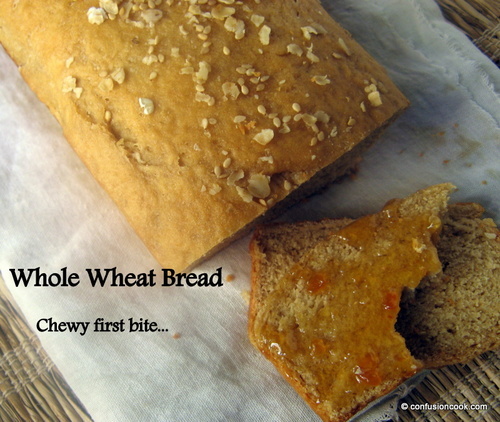 I felt it was a good substitute, hardly any flavor of it’s own thereby it didn’t affect the flavor of the bread. A colorless & odorless oil works best in baking in my opinion. Canola Oil by Hudson is now available in India. I felt that sugar is a bit low, so if you want you can increase the sugar by 1/2 Tbsp. We prefer less sugar so for us it worked. Place 1 Cup lukewarm water in a bowl and stir in brown sugar. Sprinkle the yeast over it & leave the bowl undisturbed for about 10 minutes until bubbly. In a large bowl, combine flour, powdered milk & salt. Add in oil & yeast mixture. Combine till the dough starts leaving the sides of the bowl. Transfer the dough to a lightly greased flat surface or counter. Lightly grease your palms & knead the dough using the heel of your hands for about 8-10 minutes until the dough is smooth and elastic. Add more water if required. Dough should be soft yet firm enough to knead. Transfer the dough to a lightly greased large bowl, coat the dough with oil. Cover with a cling film. Allow the dough to rise in a warm corner till puffy though not necessarily doubled in bulk about 1 to 2 hours, depending on the warmth of the kitchen. Once the dough has risen & puffy, transfer the dough to a lightly oiled work surface. punch it down using your fist & knead it lightly for a couple of minutes. Shape it into an 8″ log**. 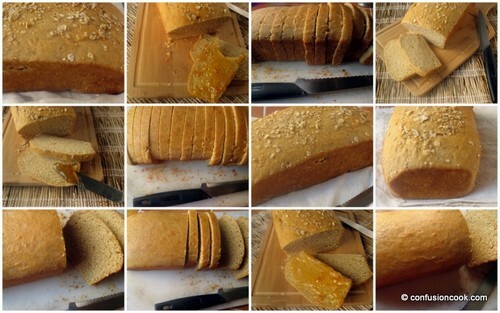 Place the log in a lightly greased 8 1/2″ X 2 1/2″ loaf pan and cover the pan loosely with lightly greased plastic wrap. You can use a shower cap here. Allow the dough to rise for another 1 to 2 hours or till the center has crowned about 1″ above the rim of the pan. 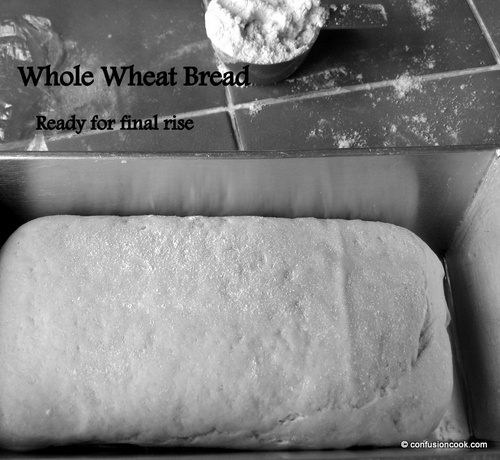 Towards the end of the rising time, preheat the oven to 200 C. On the risen dough, brush milk & sprinkle sesame seeds & oats. Bake the bread for about 30-35 mins. The bread should hollow when tapped. Cool for 5-10 minutes in the pan & then turn over the bread. Rub a stick of butter over the crust, if desired. 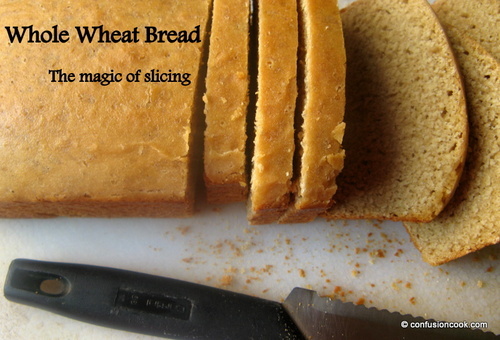 The butter will soak in yielding a soft, flavorful crust & a beautiful satiny finish. Slice when completely cool. Serve toasted or as a sandwich. * Use greater amount of water in winter. Lesser in summer or humid weather. Lightly flour a table top or counter. 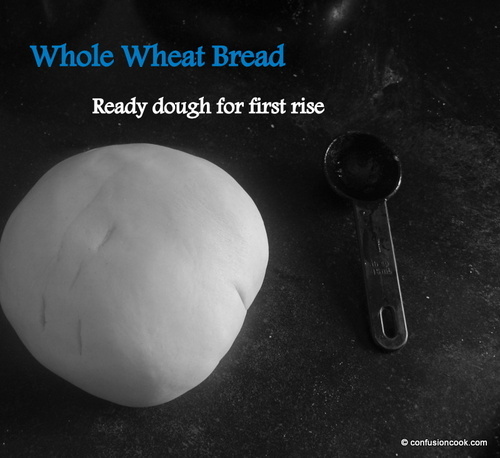 Start by shaping the risen dough into a round. Let it rest for few minutes after you this to give gluten a chance to relax. This makes shaping a lot easier. Using the heel of your palms, gently flatten the round into a rough rectangle. The way one would fold a letter into 3 fold, fold the dough – fold the bottom third of the dough over on itself. Then fold the top of the dough over the other layers. Use your fingers to pinch the dough closed where the top layer meets the bottom layers. Pinch the sides too. If the dough still feels little loose after the initial folding, just fold it in half again & pinch it closed. 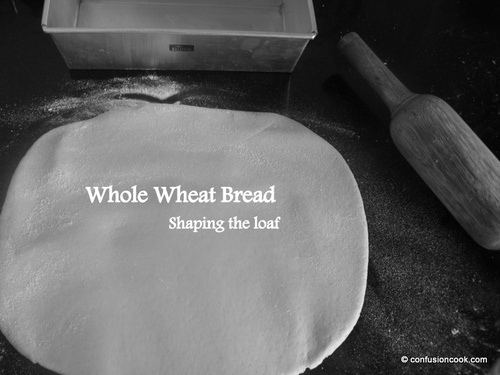 Do this by pressing the middle of the dough & drawing up the sides. Loaf should be taut for even rising & holding the shape. Roll over the dough until the seam is facing down. Gently lift the loaf into your pan. The seams should be on the bottom with taut surface facing up. Black & White Wednesday # 78 hosted by Aparna. BWW is an event started by Susan, currently managed by Cinzia.